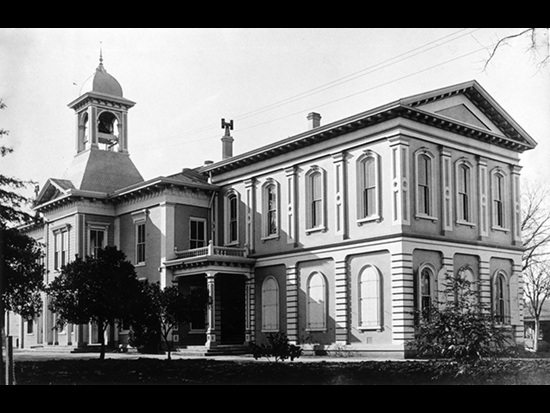 Tehama's first courthouse in Red Bluff was a popular meeting place for unions, political parties, baseball teams, and other community groups. On Sundays it was also a popular place of worship after the sheriff struck a compromise and allowed use of the court by Baptists in the morning, Presbyterians in the afternoon, and Methodists in the evening. The tower was added to the building in 1880, one of many improvements to the building and the grounds. The building was demolished in 1920 to make room for a new facility.